Faux-depth and a superficial appreciation for the kitschier elements of science fiction and Japanese culture make for a great album to sell to hipsters everywhere. 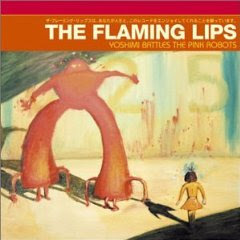 And so The Flaming Lips hit the big time with an album that sounds a bit too calculating to be a great work. I don't really dislike the music here, it annoys me more than anything, this soooo original concept/electronic/rock album which sounds so fresh to so many who have been born after 1975 is actually little more than re-hashing Genesis style prog-rock. But that is uncool. Really if I want to listen to this I'd much rather get out The Lamb Lies Down on Broadway, which is much more ambitious and less calculating... and yes, more ridiculous making it much more fun. So blah. 2. Are You a Hypnotist?? The vocal melody of track one, "Fight Test", echoes Cat Stevens's "Father and Son". Stevens, now Yusuf Islam, is receiving royalties following a relatively uncontentious settlement. The band's frontman, Wayne Coyne, claims that he was unaware of the songs' similarities until producer Dave Fridmann pointed them out. This claim however is contradicted by his statement to Rolling Stone magazine: 'I know "Father and Son" and I knew there would be a little bit of comparison. "Fight Test" is not a reference necessarily to the ideas of "Father and Son", but definitely a reference to the cadence, the melody, and chord progression. I think it's such a great arrangement of chords and melody.